The Compact+ by Optelec is designed for individuals with an active lifestyle who require portable magnification on-the-go. 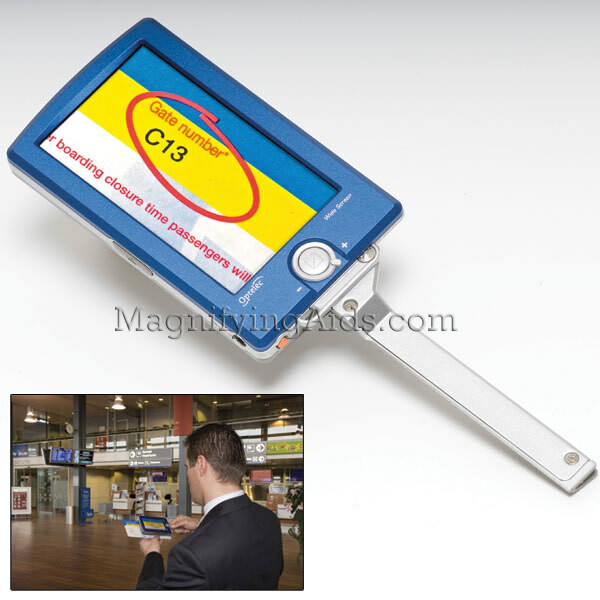 The Compact+ digital magnifier easily fits into your purse, schoolbag, or briefcase. The Compact+ comes with 2 AA batteries with 3 hours of continuous use and provides 2X to 10X magnification on a 4.3" widescreen TFT color screen. Reading a menu or signing a check is now easier than ever with the Compact+. * 4.3" color TFT screen. * Camera positioned at center of screen for writing capabilities. * Retractable hand grip for optimal reading convenience.